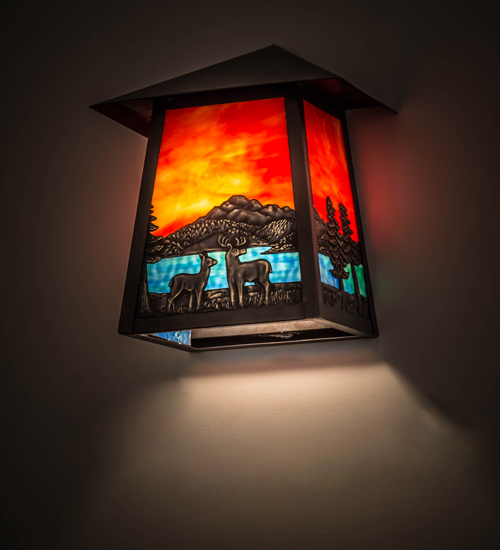 Description: This nature inspired sconce depicts a Solid Brass Deer and Mountain with a brilliant Blue-Green mountain lake and a Sunburst Sky art glass background. The lantern is enhanced with Solid Brass decorative accents and a frame featured in a Craftsman Brown finish. The fixture is handcrafted in the Meyda facility at the foothills of the Adirondack Mountains in the USA. Custom designs, sizes, colors and dimmable energy efficient lamping options are available. This wall fixture is UL and cUL listed.